What's up with Energy regen? After I've finally changed up my gear to mastery (as you can see in this beautifully edited file attachment) and playing around with AP for quite a while, I've noticed a huge lack on energy regen in contrary to the crit focused build with exsang. I know that energy is regenerating way faster during exsang, this is not my issue I'm trying to address here. But I've come to believe something is not really working properly with venomous wounds when running with AP, or am I simply missing out on something? I'm having a really hard time with my energy household, I need to pool way often and way longer than I've ever needed with exsang skilled and deadly poison applied. Is anyone else expieriencing the same issue? I'm really confused. As I mentioned, I'm NOT talking about times where exsang is being used, I'm aware of that. 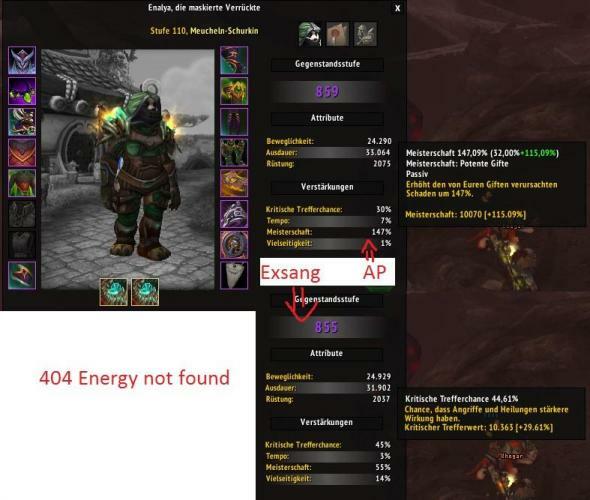 I'm generally having trouble with my energy when I'm running with AP instead of Exsang although it should not change anything considering venomous wounds. Looks like you just have a lot less crit, which means you'll be generating fewer CPs with Seal Fate and need to spend more Energy on Muts to generate them. I see, thank you for your advice. I totally overlooked the extra CPs from crits. I have opted my gear to a crit/mastery ratio close to the ratio from the stat weights, which lies at about 0.8. I'll see how it'll work out. Also notice that AP only has a 20% chance to apply while DP is 50%. You might not have the poison applied yet and could be the reason. I notice that has been the problem with my initial energy gains. Sin rogue ”duel” opener with Mantle of the Master Assassin? So I’ve read the Icy Veins Sin Rogue PvP Guide that suggests Cheapshot > Garrote > Mutilate > Rupture as an opener. It works very well, but I’m wondering if I should use another opening rotation with MotMA (gives 100% crit chance for 5 sec after exiting stealth mode)? I know that legendaries aren’t active in arenas, but I was thinking in wpvp/duels. So with this setup, I have too much haste. Like, way too much. What do you think about dropping the tier helm and swapping to the Crown? It would fix 3 stat issues at once (haste/crit/mastery), but I can't quite figure out how much of a loss it would be to lose either the shoulders or boots. I've run it 5 different ways and it comes out as a near-wash with every permutation. How much mastery to use a poison build? Hey all, I apologize if this is common knowledge, but my rogue is one of my alts and I don't know as much about the class as I'd like. I used to play outlaw just fine, but I'm interested in a strong spec that isn't so RNG dependent. I'm a bit confused as to how much mastery is needed to pull off a poison build vs a bleed a build. The talent guide says to go for poisons if you have a mastery-heavy build. What constitutes a lot of mastery? My rogue is wearing ilvl 847 with 27.79% crit, 7.83% haste, 116.2% mastery, 3.6/1.8% versatility. That is based on recommendations from Ask Mr. Robot. I primarily run mythics and I would like recommendations on the best tier 1 and 6 talent suggestions. Hello, I was wondering if there is a WA that displays Agonizing Poison's increased % dmg without having to mouseover to get the tooltip. if not, would anyone know how to make a custom Lua function that displays exactly that?